100% of the proceeds are going to Onaman Collective's Land Fund to support a year round traditional knowledge, language and arts camp for Indigenous Youth and Elders. All across North America, Indigenous communities and people are on the rise. Communities across the continent are working hard to restore Indigenous languages and traditional knowledge. The Onaman Collective is Isaac Murdoch (Anishinaabe/Michif from Serpent River First Nation), Christi Belcourt (Michif from Manitou Sakahigan) and Erin Konsmo (Michif from Manitou Sakahigan). 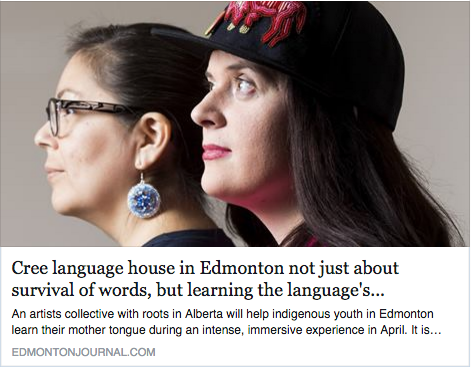 We are 3 Indigenous artists who believe in supporting, building and strengthening our communities, and in particular we want to create as many opportunities for youth to be connected to language, land, traditional knowledge and arts practices as possible. 100% of all the proceeds from these sales will go directly to our Land Fund. Our goal is to build a permanent year-round culture camp. We believe in giving all we can so the next generations can thrive.